It is just hard to believe that it has been 15 years since that beautiful, peaceful Fall September day when America was attacked by radical Islamic terrorists and the world would be changed forever. The horror and the tragedy that saw nearly 3000 people die as of both towers of the World Trade Center falling in New York City, the Pentagon in Washington, DC under attack and hit by a plane and the heroes of flight 93 downing the plane in a filed in a field in Shanksville, Pennsylvania saving countless many. Have you forgotten? I ask you on this 15th anniversary of the September 11 attacks to hot only remember the victims and heroes of 9-11, but to honor them as well. The reality is that those lost on that fateful day could have been any of us. And today, some 15 years later after America was attacked by radical Islam, we are still dealing with this menace. We can not only remember those that have fallen, the best way that we can honor all those who lost their lives that September day is rid the world once and for all of this vile evil. 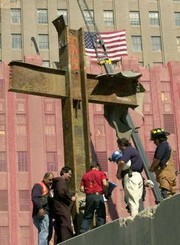 God Bless all who perished that day and a special prayer to the family, friends and loved ones of those lost that day. We remember and honor those who perished on AMERICAN AIRLINES FLIGHT 11, AMERICAN AIRLINES FLIGHT 77, UNITED AIRLINES FLIGHT 175, UNITED AIRLINES FLIGHT 93, the World Trade Center in NYC and at the Pentagon in Washington, DC. We live in a world that is more dangerous than September 11, 2001 because of political correctness and cowardly leaders not willing to admit the truth and who and what we are frighting. Make no mistake, America never has declared war on Islam, however, radical Islam has declared war on the West and America. The single most killing and worst attack in Paris, France since World War II … Is it now okay to call ISIS and radical Islamist terrorists Nazi’s? The Guardian is reporting that scores of people have been killed in Paris, France as many people were attending a rock concert at the Bataclan music hall. It is reported that the terrorists were shouting “Allahu Akbar!” The coordinated attacks took place across Paris as shots were fired inside the Bataclan music hall and inside the soccer stadium you could hear the suicide bomber during the match! 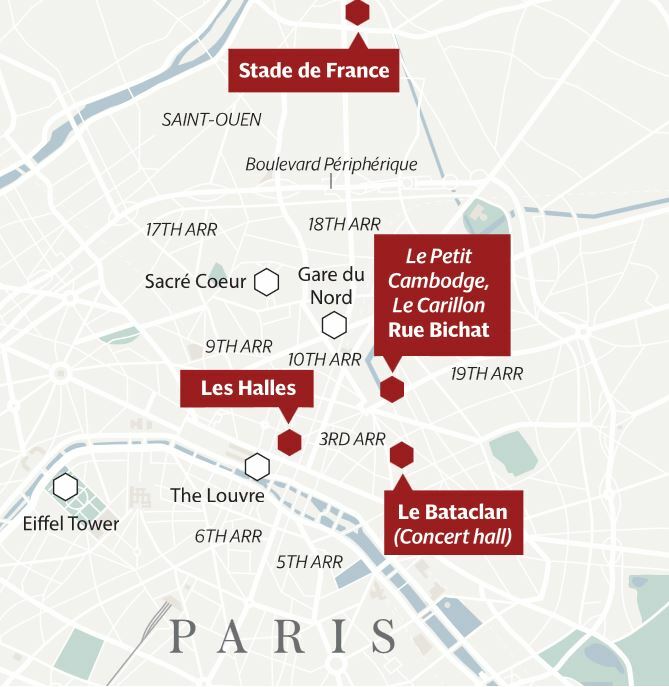 A Paris city hall official said four gunmen systematically slaughtered at least 87 young people attending a rock concert at the Bataclan music hall. Anti-terrorist commandos eventually launched an assault on the building. The gunmen detonated explosive belts and dozens of shocked survivors were rescued. Some 40 more people were killed in five other attacks in the Paris region, the city hall official said, including an apparent double suicide bombing outside the national stadium, where Hollande and the German foreign minister were watching a friendly soccer international. Some 200 people were injured. Paris public prosecutor François Molins said the death toll was at least 120. City of Paris witnessed its worst attack since the Second World War. Paris awoke to a day of fear, mourning and anger on Saturday after a night in which the city witnessed its worst attack since the Second World War. “This time it’s war,” Le Parisien said across its front page after a string of coordinated attacks in the French capital left an estimated 150 people dead and 200 injured. Authorities warned that “accomplices” were likely to be still at large in the city, that was placed under a curfew for the first time since the Nazi occupation in 1944. Black-clad gunmen attacked at five sites in the centre of the city and at the Stade de France, in the north at around 9.30pm local time. The gunmen shouted “Allahu akbar” as they attacked. There was no claim of responsibility from Islamic State of Iraq and the Levant, despite much speculation that the group was involved. It was 8:46 am September 11, 2001 when America would be changed forever. Watch the video below from FOX News of the actual reporting from that fateful day as it happened. Damn, it was like it was just yesterday. 14 years later, so many have come and gone in our lives, yet that day remains frozen in time for all eternity. As reported at the New York Post, Al Qaeda terrorists are plotting to blow up five passenger planes flying between European cities as part of a Christmas “spectacular,” in a 9-11 like attack. 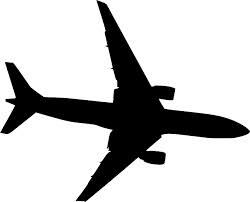 According to credible sources, the threat is aimed at Europe,” adding, “The US has improved their security over the summer, but we have not.’’ because of the threat, British airport officials may require devices such as smartphones and iPads to be placed in checked luggage. May? Also, the threat has been deemed so seriously that officials may have an outright ban on all hand luggage. The fear is also that the future terrorism could be carried out by sleepers or western converts who could very likely have blue eyes and blonde hair as opposed to dark skin and beards. Terrorists are plotting to blow up five passenger planes flying between European cities as part of a Christmas “spectacular,” according to a British newspaper report. London authorities were the first to uncover the threat, which would involve midair bombings, a source told The Post. The plot, which has been known about for the past two months, is thought to involve Islamists smuggling bombs on to planes bound for major European destinations before Christmas. The well-placed security insider said talks had been held about how to deal with it, with suggestions made to ban hand luggage. The source said: “High level negotiations are continuing at Governmental level but at the moment there has been little done to respond. “There is paralysis because of the difficulty of banning hand luggage which is one of the strongest weapons we have against the new threats. “All electronics may be banned from hand luggage and placed in the hold, that has been considered, and there has been behavior analysis training at airports but while it’s effective, it’s difficult to roll out quickly and is not a sufficient safety net.